The “Maiden Voyage” CD Release Celebration will also take place on Saturday, October 26 at Down Home Guitars in Frankfort, IL. The all-ages show will highlight Eric’s fun-spirited new music and include special guests, making it a night not to miss! “Maiden Voyage” will be available to be purchased for the first time, and at a discounted price at the show. Tickets are on sale now for only $10 and can be purchased by contacting Down Home Guitars at (815) 469-6321 or www.downhomeguitars.com. Eric Lambert has been pickin’ and grinnin’ his way into people’s hearts for over 40 years. 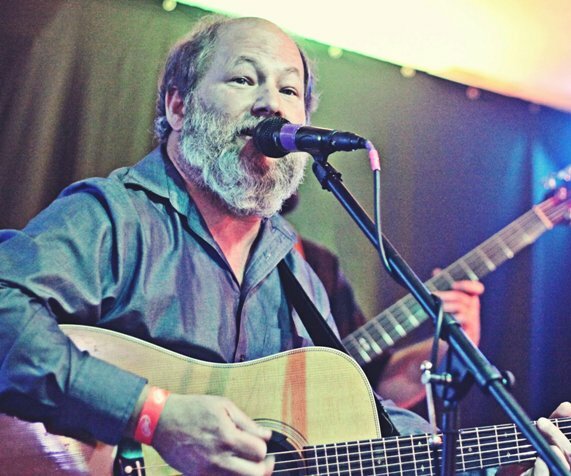 Specializing in the fiery art of flatpicking, he has built a distinguished career writing, performing, recording, and teaching Americana music. Traces of rock, folk, bluegrass, country, and blues can be detected throughout his music, delivered with energy, soul, and inspiration. His voice, presence, and precision moves audiences to their feet, while his playful spirit and warm sense of joy makes people feel right at home. Eric Lambert’s new record, “Maiden Voyage,” features Steve Haberichter on mandolin, Pat Fiddle on fiddle, Dan Rogers on bass, and Eric Lambert on guitar, dobro, and lead vocals. It was recorded at Thunderclap Recording Studio and produced by John Carpenter and Eric Lambert. Learn more at www.thunderclaprecording.com. The album artwork was hand-drawn by Jon Griffin; www.jiveafro.com. Set sail with Eric Lambert & Friends for an epic “Maiden Voyage” beginning October 26. It is sure to warm your heart, ease your soul, and get your body moving to the groove. Fill every day with a smile and a song. “I’m grateful to have this opportunity for a new beginning in my life,” Eric said. “And I’m thankful for all those who listen and support what I do,” he concluded. Learn more about Eric Lambert and buy the new record “Maiden Voyage” on Oct. 26 at www.ericlambert.com.